← The Duke and Duchess of Cambridge Expecting Baby in April 2015! The Cumberbabe strikes again! Whether LIVE and in person on the red carpet, arriving at airports, walking down the street…or simply as a wax figure…it seems Benedict Cumberbatch creates quite the frenetic frenzy wherever he goes…and it doesn’t look like the fury is going to die down anytime soon! Take a look…. 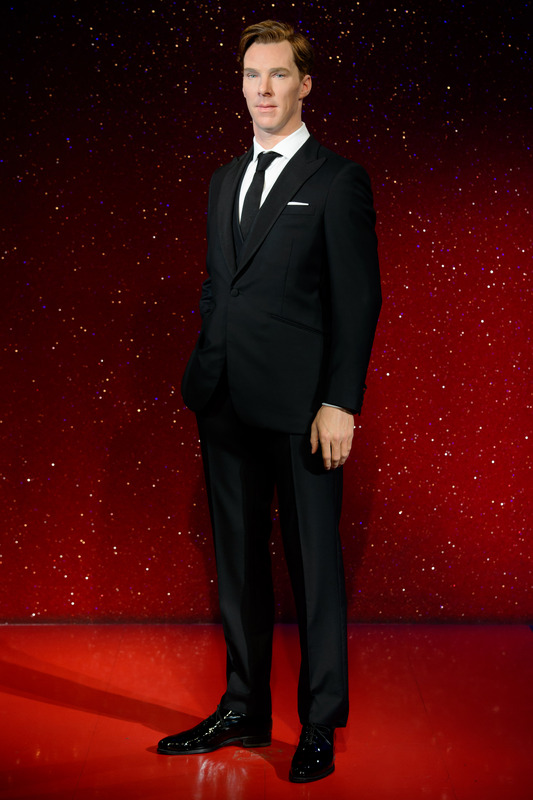 Presenting: Benedict Cumberbatch in WAX at Madame Tussauds London! 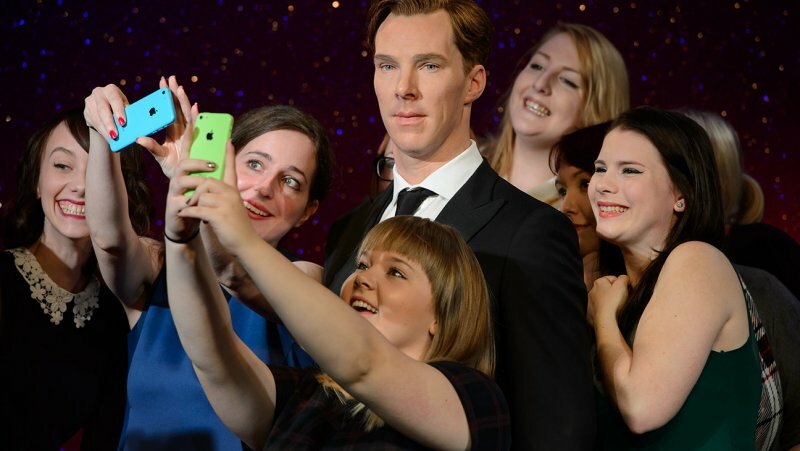 Cumberbatch’s dashing, life-like wax figure debuted at Madame Tussauds London on Tuesday to a bevvy of enthusiastic female fans who clamored for their opportunity for a selfie with the Sherlock star. And what a perfect opportunity it was…as this version of the Cumberbabe had nowhere to run! Perfect Selfie opportunity…the subject is a captive audience! And understandably so, as Benedict has been one of the busiest actors in Hollywood for the last two years with upcoming releases including, “Penguins of Madagascar”, the early Oscar favorite, “The Imitation Game”, and the highly anticipated “The Hobbit: The Battle of The Five Armies”…not to mention another season of the hit BBC series, “Sherlock” on the horizon! That is one busy schedule. A clone would indeed come in quite handy! Benedict has yet to visit his wax likeness however but says, “I’m excited to see the finished, perfect, waxy me, although slightly terrified. The work is so detailed it’s going to feel a little uncomfortable and surreal seeing what I really look like.” And what he looks like, according to those that were privy to the debut, is nothing less than gorgeous. Fans could not keep their hands off the finished…perfect…waxy…he! And, do you blame them? It is the waxy, perfect he! Of course all of this hands on activity must have the officials at Tussauds slightly worried due to the fact that a recent wax statue of teen-idol Justin Beiber had to be pulled from the floor due to the heated hands of over-enthusiastic fans! Heat and wax…probably not a good combination. But Ben is not bothered by any of that in fact wishes his wax figure had other features: “I just wish it could take selfies and sign autographs.” No kidding Sherlock! 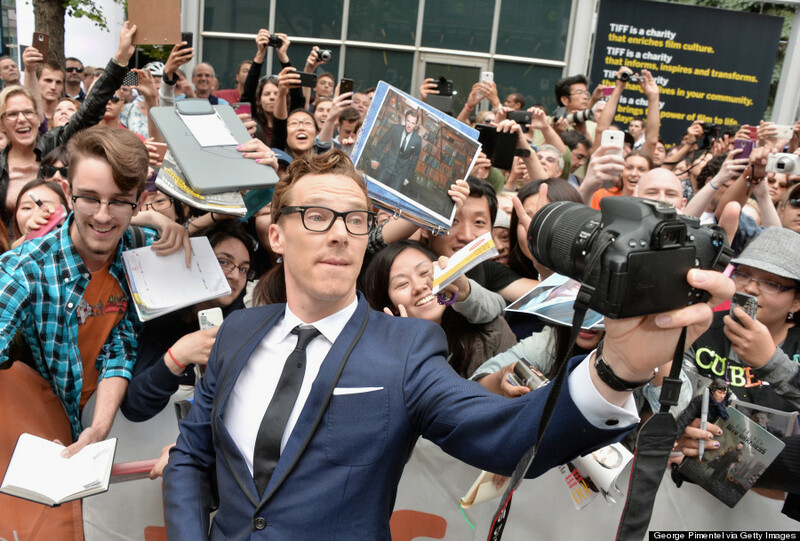 We’ve already seen the mobs of fans that await him at every public event, hoping for their photo-op…which he often assists with by taking the selfie himself! Who else does that? The Selfie-King! That’s why we love him! 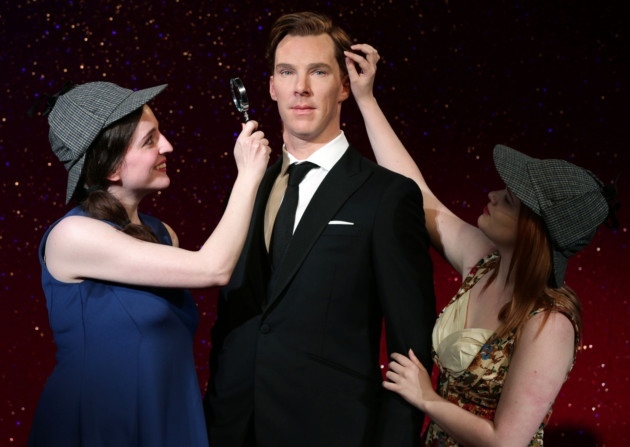 I personally feel that they should have made wax figures of the CumberCollective as well…because where there is Benedict there is the CumberB**ches! They are quite the impressive group of worldwide supporters! I hope Madame Tussauds is ready for the ‘around the block’ queuing that is destined to happen with the Cumberbabe in the house! And for those that are unlikely to happen upon him in person anytime soon, this incredibly dead-on likeness is truly the next best thing! Now if only they could make these statues talk…fans might never leave! Lady Anglophile….hoping they sell souvenir ‘take home’ versions in the gift shop! This entry was posted in The CumberWatch and tagged Benedict Cumberbatch, Madame Tussauds. Bookmark the permalink.